Every few weeks, someone emails me a link to this bike. It’s one of the most famous BMW boxers on the net. But it’s also widely reported, so I’ve been resisting the temptation to feature it, until now. What’s so special about it? The Team Incomplete website explains it best: the objective was to “build a cafe racing boxer that was both pleasing to look at and inspiring to ride.” The bike was bought for just $950 and then virtually destroyed after a 70mph tankslapper; since then, everything has been heavily modified by master builder Scott Kolb. A ’92 R100GS provided a new frame—thoroughly cross-braced, lightened and strengthened—plus the paralever and transmission. The engine is mildly tuned, running a 9.5:1 compression ratio, a 336 BMW sport cam, 44mm intakes, titanium retainers and 40mm Dell’Orto carbs. The seven-gallon asymmetrical tank, nine months in the making, came from Scotland. 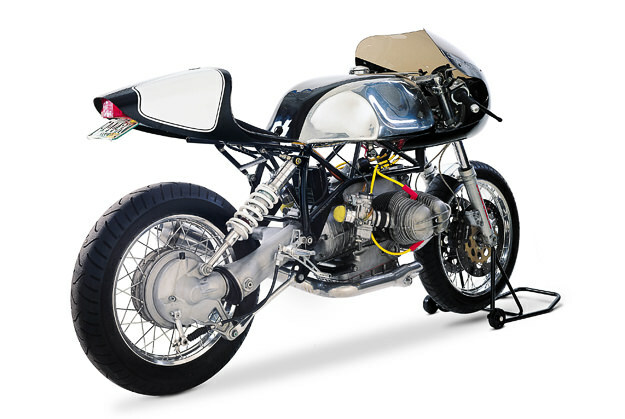 The top clamp is from an early Ducati 851. And the seat is a Harley XR750 number from Airtech. Many more details are revealed on the terrific case study on the Team Incomplete website, with images from owner Gregor Halenda—a professional photographer.